WE ARE THE CHAMPIONS SEASON 2018/2019 Penicuik are the Conference A Champions - a 1-1 draw earned the Cuikie with the one point needed to clinch the title. Well done to all the players, management and fans for this fantastic achievement. CLICK HERE to view the celebrations immediately after the final whistle. RYAN BAPTIE GIVES AFTER MATCH INTERVIEW VS MUSSELBURGH Ryan gives after match interview CLICK HERE to watch the interview. ENTRANCE TO PENICUIK PARK - NEW ARRANGEMENTS Change to Entrance Arrangements at Penicuik Park On matchdays in the future we will opening a 3rd entrance point to the ground at the High School end. All spectators entering from the Carlops Road/School entrances to Penicuik Park should use this entrance point. There will be strictly no access to the main entrance from this route. Spectators entering the Park from John Street or Jackson Street should continue to use the main entrance or the John Street entrance. At full time spectators heading to Carlops Road should exit the ground by the Gates at the High School or Angle Park ends of the park. Please respect these arrangements and we thank you in advance for your support. DRAW FOR THE NEXT ROUNDS OF THE KING CUP The 3rd and 4th rounds of the King Cup were drawn live on Black Diamond radio on Wednesday 6.3.19. Penicuik have a home draw against Linlithgow Rose in the 3rd round. If successful, we have an away tie against Lothian Thistle or Musselburgh Athletic or Camelon Juniors in the 4th Round. CLICK HERE for the full draws. 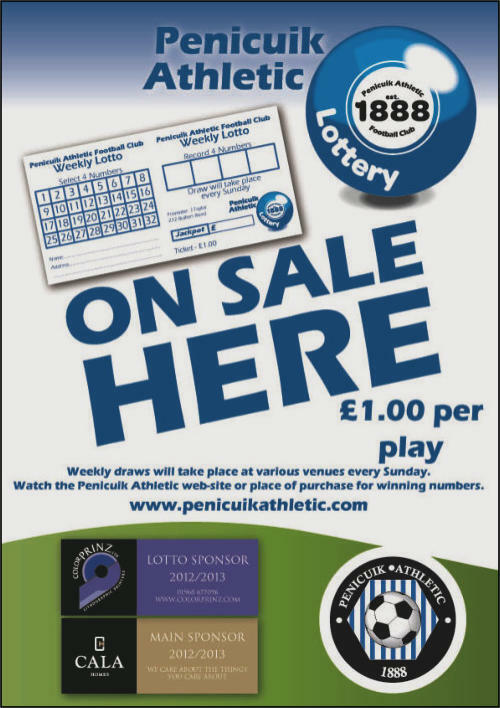 PENICUIK LOTTERY The Penicuik Lottery numbers for Tuesday 16.4.19 were 8, 19, 28 and 30 - no jackpot winner, 3 numbers paid £30, next week jackpot is £5000. 2nd jackpot is £4200 The jackpot prize is capped at £5000. A second jackpot will then set up and will be increased by £100 each week until the £5000 jackpot is won. CLICK HERE for full details of the lottery 50/50 Club T he February winner of the 50/50 draw was Alan Black who wins £250. CLICK HERE for full details of the 50/50 Club.